William Floyd Thompson, 90, of Appomattox passed away, Thursday, April 4, 2019 at Southside Community Hospital, Farmville. Born in Charlottesville, October 8, 1928, Mr. Thompson was the son of the late Floyd Massie Thompson and Leafie Lillian Campbell Thompson. 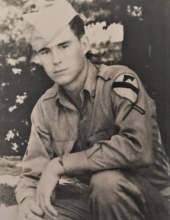 He was a highly decorated U. S. Army veteran of WW II, Korea and Viet Nam having received numerous medals and commendations including a Purple Heart. Following his retirement from the Army, he enjoyed caring for facility and horses at Sweet Briar College Riding Center. In addition to his parents, he was preceded in death by five brothers: Roy Rogers Thompson, James W. “Dolly” Thompson, Raymond Thompson, John Thompson and George Thompson. He is survived by his wife of over 51 years, Jacqueline B. Thompson of Appomattox; children: Suki Matsuhashi of Utah, Susan Marie Thompson of Hawaii, and Barbara Thompson of Virginia; step-children: Norman Carroll and Penny West, both of Virginia; brothers: Freddy Thompson of Washington State, and Glenn Harrison Thompson of North Carolina; sisters: Dorothy :Sisters” Biggers and Iris “Ginny” DeHooge both of Virginia; ten grandchildren and twenty great-grandchildren. A graveside committal service will be held at 1:00 PM, Friday, May 24th, 2019 in Amherst Cemetery, Amherst, VA with Military honors by American Legion Post #16. To send flowers or a remembrance gift to the family of William Floyd Thompson, please visit our Tribute Store. Guaranteed delivery before William 's graveside begins. "Email Address" would like to share the life celebration of William Floyd Thompson. Click on the "link" to go to share a favorite memory or leave a condolence message for the family.